The house that is now 10 Castle Street in Thornbury has a long and complicated history. On the right we have a photograph of the rear of the house. It is possible to see from this that at one time the main building was at right angles to the street rather than facing it. Some researchers from Thornbury Museum were lucky enough to be given a tour of Wigmore House by its then owners in 2005. These researchers (Roger Howell, Meg Wise, Heather Palmer and Liz Wilkins) commented on the wonderful plaster ceiling decorations, which were believed to show Tudor roses, two cellars, a possible ice house, a spice cupboard, a bread oven and underground water cisterns. They were able to see that the original front door was still in position on the side of the house and where the Georgian front of the building was added. 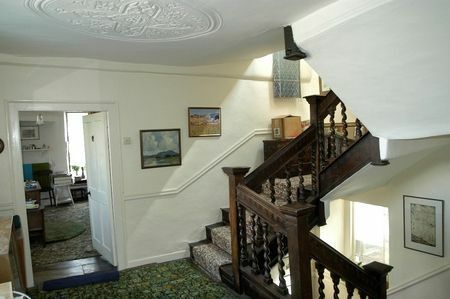 The old staircase was said to be late Seventeenth Century (see below). The owner also allowed them to examine the deeds and some of the information we have here on the website comes from the notes they were able to make at that time. We know that Wigmore House is one of the older houses in Thornbury and we believe that one of its earliest owners was Katherine Rippe who left the property to her goddaughter Katherine Tayer in a will made in 1594. The descriptions of Wigmore House often included a mention of the land and outbuildings (generally a barn or coach house) for much of its history. In 1633 Katherine Tayer called it “a messuage and barn called Wigmores and four acres of land within the borough”. In an indenture dated the 29th of September 1841 it is stated that part of the house had been rebuilt. This was perhaps the Georgian wing that was added to the older house some time between 1818 and 1841. However the property still sounded very much like a farm. At this time the property included four acres of pasture or arable land called Mondays or Mondays Land which had belonged to the house of which two acres had been planted with fruit trees and called the orchard and two acres of arable that had been enclosed out of the common field known as the Tiltfield in the tithing of Kington in the manor of Thornbury. Also included were a stable and coach house, formerly a barn or workhouse adjoining the yard of the house. Indeed when Edward Long came to sell Wigmore House in 1863, 230 years after the first description of the property it still recognisably a farmhouse, although the land had been reduced and the house has been much gentrified and modernised according to the fashions of the time. The photograph at the top of the page was taken in February 1963 before a major refurbishment took place. The photograph on the left was taken in June 1963 after the refurbishment. Note that bay windows have been added upstairs and all the window frames seem to have been replaced. Wigmore House was often said to be haunted. We have been told that when Dr Lionel Williams bought the house in 1924 his wife would not live there because of the ghosts. Hilary Newton, the daughter of Dr Prowse who lived there next, saw a ghost at Wigmore when she was about 20. She turned off a light in the hall and apologised to the person who was on the staircase for plunging them into darkness. When Hilary then walked in to the sitting room the family were all there and there was no one who could have been on the stairs. She knew it was a lady she had seen because she was aware that the figure had a long skirt. Other people had experienced ghosts in that house. A friend of Dr Dorothy Prowse who lived in the house for a time was aware of a presence in one of the bedrooms and once felt someone was pulling the bedclothes off her. Another visitor had experienced the same thing but Hillary was the only one who we know who admits to having seen it.